Today is Ash Wednesday, the first day of Lent. 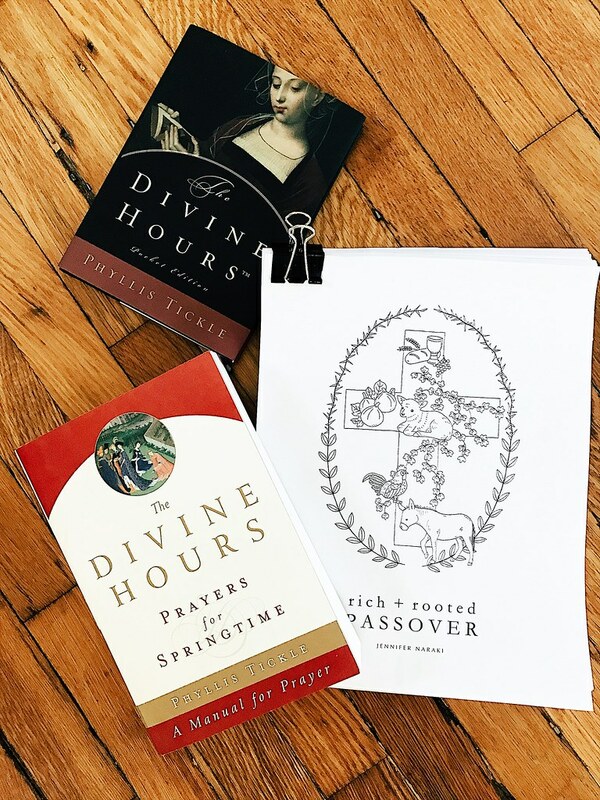 For the observance of this season as a family, we will be participating in the #richandrootedpassover created by Jennifer Naraki who also put together the #slowandsacredadvent we did in in December. Her Advent work was filled with beautiful crafts, recipes, and readings that will become family traditions for us, and I am confident that her Lenten work will be the same. For the observance of this season for me personally, I will be practicing the traditional fixed hour prayer for the duration of Lent (Phyllis Tickle's work on this is considered the easiest to access for modern practitioners). A couple of weeks ago, I finished reading Flunking Sainthood by Jana Riess. Of all the practices she attempted, fixed-hour prayer (also known as the "Divine Offices" or "the liturgy of the hours) is the one she seemed to enjoy the most. She wrote of the relief of not having to constantly create new prayers to God, and she found joy in knowing others around the world were praying the very same prayers and had done so for hundreds of years before her. I love a good ritual, and I was inspired by her account of her experience. I ordered the books over a month ago, and I've been so looking forward to getting started. Wishing you a blessed Lent filled with peace, introspection, and the eventual joy of a risen Savior. Hi, I'm Kelli. I like v. dark chocolate, cloudy beers, cute babies, and really old stuff. This is my diary.